Audi is testing an application system that allows it to paint vehicles more than one color at a time in one pass, without any overspray between different-colored panels. Unique to the industry, it’s being tested at a pilot paint shop in Ingolstadt, Germany, painting vehicle roofs black to contrast other body colors. Painting a car in different colors at once is both economical and environmentally friendlier than having to make multiple applications, the automaker said in a statement. 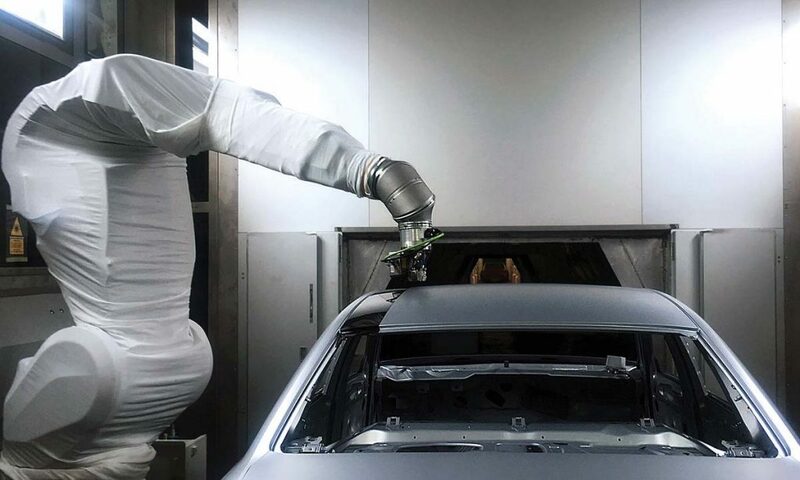 Eliminating time-consuming and material-intensive masking off would no longer be necessary, “saving time and money.” A robot-controlled, high-precision instrument measures the laser-braised seam between the roof and side-panel frame before a special applicator applies the paint without creating any overspray mist. Two colors, one process: Audi is expanding the spectrum of its painting methods with the addition of overspray free painting. In a pilot paint shop at the plant in Ingolstadt, Audi is testing a method that is unique in the industry with car roofs in contrasting black.